I have always been puzzled why the Hermitage (in St. Petersburg, RU) was considered so unique in the world’s great museums – having been to many of them, the Met in NYC, the Louvre, The Prado, The British Museum, just to name a a few. I have found that smaller museums are more to my taste and have collections more special for their selections. 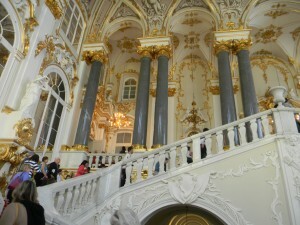 The collection of the State Hermitage includes more than three million works of art and artifacts of the world culture. Among them are paintings, graphic works, sculptures and works of applied art, archaeological finds and numismatic material. The collection is a wide range of old master up through impressionist and early modern. 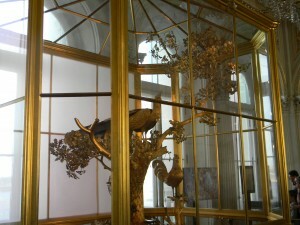 Housed in a glass and guild cage we saw this amazing Peacock Clock, which we have provided a picture of. Below is a little history of the symbolism of this treasured item. Eighteenth-century philosophers were of the opinion that a clock was a mechanical model of the universe and its task was to “count” time, following the movements of the heavenly bodies. Each of those bodies and each time of day or night were associated with particular birds that more than others reminded people of the “onward march of time”. The symbolic significance of the birds depicted would have been clear to contemporaries.The peacock is the most rich in astral symbolism: it represents the cosmos, the sun and the lunar disk. The most impressive moment – the solemn opening of the tail and its rapid folding is a symbol of the unity between the appearance and disappearance of all that exists. The owl is a sign of night, quiet and wisdom, but at the same time it is a companion of Atropos, the last of the three Fates or Moirai that cuts off the thread of life, hence a symbol of darkness, sorrow and the end of life. The cockerel, whose crowing announces the sunrise, is a symbol of the birth of light, life and resurrection (it is one of the emblems of Christ).The movement of the birds in the Hermitage clock begins with the disturbing syncopated melody of the little bells on the cage of the owl (night), then the peacock opens out its “sun-tail” and turns around, showing the viewer for an instant the silvery back side of its tail. Then the bird turns around again; the silver of night disappears; the golden disk of the sun returns to the center. Its rise is announced by the crowing of the cockerel. Thus the Peacock Clock is a symbol of the continuity of life, in contrast to the usual perception of any timepiece as a memento mori, a reminder of mortality.